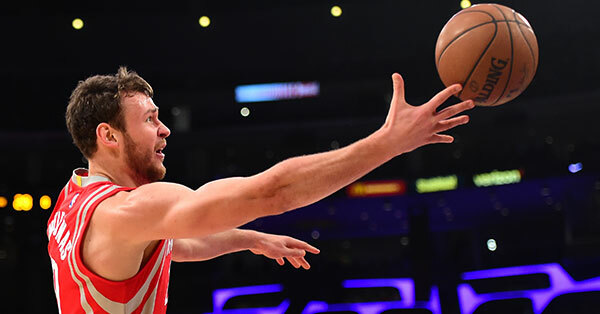 In a surprising deadline day move, the Rockets have traded Donatas Motiejunas to Detroit. The Rockets have lots of issues on the court and a pressing need to make changes, but this one was surprising. Houston traded Donatas Motiejunas to the Detroit Pistons on Thursday along with Marcus Thornton for a protected first round pick and Joel Anthony, according to Yahoo! Sports. The Rockets have reportedly sent Anthony and his contract to the Sixers, sending Philly a second round pick for taking on the remaining salary. The pick is reportedly top-8 protected this season. The Pistons, currently a .500 team at 27-27, are a half-game back of the playoffs in the East. However, they now add Motiejunas and acquired Tobias Harris from the Magic earlier in the week. Motiejunas has been battling a back injury since late last season, having played in only 14 games this season. He’s been back and forth between Houston and Rio Grande Valley for rehab stints and was nearing a return to an NBA court. D-Mo was a key part of the Rockets last season, especially when Dwight Howard was injured. In 41 games with Dwight out, D-Mo was the team’s second-leading scorer, averaging 13.8 points on 58.8% shooting and a blistering 42.2% from three-point range. The Rockets were 27-14 in those games. I had heard concerns about his back injury, but I didn’t think the Rockets would want to part with him. Motiejunas, like Terrence Jones, will hit restricted free agency this summer. Ever since he’s been with the Rockets, I’ve heard nothing but glowing reviews about how hard D-Mo works. Thornton, who signed a league minimum deal with the Rockets this past offseason, was averaging 10.0 points this season. He was streaky, hitting 33.8% from three-point range. Joel Anthony and his $2.5 million contract, with a friendly team option for next season, was necessary for the salary match but he will go to the Sixers. The Rockets, if they make the playoffs, will be without their own first round pick this summer (it will go to Denver from the Ty Lawson trade), so this move gives Daryl Morey a chip in the draft game (which I do really like), but it’s still a bit of a shock. It looks like the Rockets are thinking ahead on salaries, going for another dirt-cheap four-year rookie deal over the cost it would take to keep Motiejunas. One thing I will say is that with salaries expected to spiral out of control this summer and next, draft picks, with their set rookie scale salaries, are going to become more valuable. There was no way the Rockets were going to be able to re-sign both Jones and Motiejunas. Only the Rockets know if they planned on matching sizable offers for D-Mo. If they didn’t, this obviously is a pretty good move to get a solid first round pick for someone who will walk this summer. Granted, there is still time left before the deadline for additional moves, but the trade threw fans off because it doesn’t take care of any of the on-court problems that we’ve seen this season. Motiejunas, despite being injured, has not been part of a failed defensive unit or the cause of poor chemistry. The Rockets still have work to do to make those kind of repairs.